Megaworld Corp. (PSE: MEG), along with its subsidiary Empire East Land Holdings Inc. (PSE: ELI), is developing a 24‐hectare property along F. Felix Avenue in Cainta, Rizal, to become the Highland City township. The company’s 24th township development, Highland City will host the expansive Highland Mall with a gross floor area of around 58,000 square meters, rows of residential towers on a highland area, mixeduse towers, a church as well as open and green parks. Highland City will be highlighted by the Highland Park, an 8,000‐square meter green and open park, which will house some retail areas and a 500‐seating capacity church. The park will elevate towards the mall and will serve as a ‘grand welcome’ to the township. On both sides of the park will be a six‐lane road which will serve as the main street entrance to the township. Forty percent of the entire development will be dedicated to green and open spaces. Aside from the sixlane main road, the internal roads will be at least four lanes. 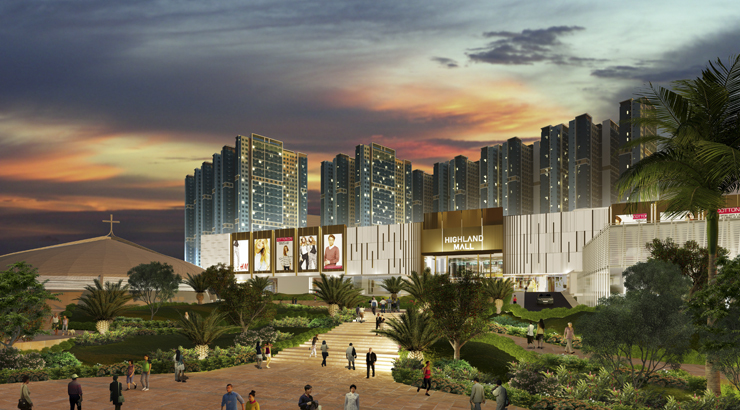 Megaworld and Empire East will spend PhP20‐billion in the next 10 years to develop Highland City. Land development will commence by second quarter of this year. Megaworld owns 82% of Empire East Land, which has been known for the development of mid‐cost housing developments including several transit‐oriented residential developments in Metro Manila and in other parts of Luzon during the last 25 years. Among its projects include Laguna Bel‐Air and The Sonoma in Sta. Rosa, Laguna; San Lorenzo Place in Makati City; The Rochester and Kasara Urban Resort Residences in Pasig City; Little Baguio Terraces and Mango Tree Residences in San Juan; Covent Garden in Sta. Mesa, Manila; as well as California Garden Square, Pioneer Woodlands, The Paddington Place in Mandaluyong City.